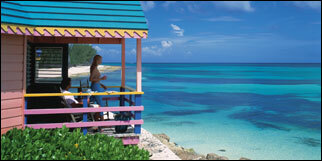 The Bahamas attracts 1.5 million visitors per year. This makes it one of the world's most popular tourist destinations. This island is a bridge away from the capital city Nassau and is home of the mammoth Atlantis Resort which features an interesting aquarium and a unique water slide. Its tourism traffic has and will continue to grow thanks to its nearness to Florida. Freeport is the main city. They are located south of the main tourism islands. They attract visitors seeking a low-keyed, tranquil setting. The pink-sand Harbor Island beach is especially alluring. The Bahamas are only 80 kilometers or 50 miles from Florida at the nearest point. This encourages many Floridians to make frequent weekend trips. Some even have weekend homes here. If you're a college student, you will likely enjoy being in The Bahamas during spring break (the period varies annually, occurring somewhere from late February to early April). If you're not a student and you seek peace and quiet, consider other dates. Bahamas photo is the property of the Bahamas Tourist Office and is used with permission.